“There’s too much to do around here,” I told Tara this morning. Tough problem to have, right? But it’s true. In the waning weeks of summer, there is too much to do and too little time. We want to go to Windy Ridge, and hike around Mount Hood, and visit the Pittock Mansion, and spend a day at Long Beach, and pick huckleberries, and go camping, and take another trip to Seattle, and…and…let’s just say if we tried to squeeze everything in before the cold and rainy season returns, we’d be doing two or three things a day. So this morning was spent drinking bloody marys and lazing around the house. Hey, you gotta relax sometimes, right? It’s okay, though: Saturday was busy. We were on the go all day. We ended up checking out not one, but two, festivals in Portland. First up was the Alberta Street Fair. I went there last year, by myself, after my plans with Tara fell through (one year ago she was supposed to meet up with me but Fate intervened and sent her to the hospital instead). That was where a belly dancer gave me the ol’ bedroom eyes and I tried bleu cheese ice cream for the first time. A fun day, to be sure, but I was on my own then. It’s much better having somebody to go with, and sure enough, Tara and I had a great time. The weekend was forecast to be hot, so we went early, and spent a couple of hours wandering around the Alberta Arts District, checking out all the arts and crafts booths and shopping and eating and drinking. The highlight? 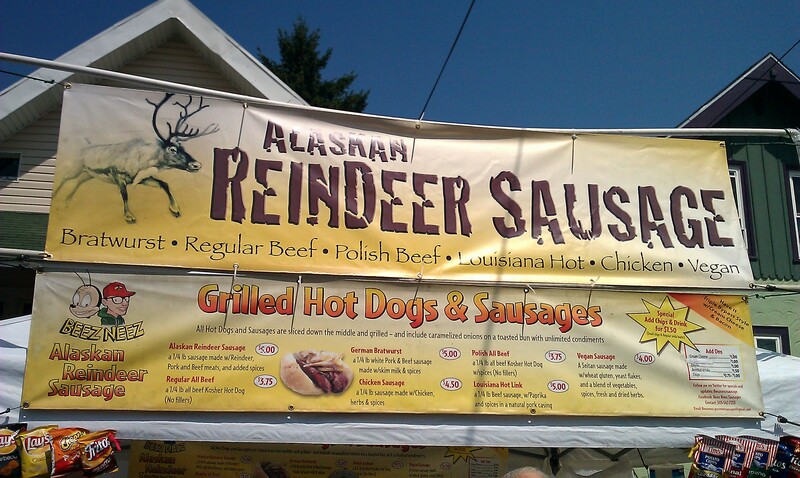 Had to be the reindeer sausage. Sorry, Santa, but Rudolph was pretty tasty! After the fair we went shopping, and returned home to collapse on the sofa and watch a movie, soaking up the air-conditioning. I’ll admit, at that point I was ready to ditch our evening plans, but fortunately a second wind kicked in and around 7 PM we drove downtown for the Bite of Oregon Festival. Once upon a time, the Bite of Oregon was a favorite pastime of mine. In the 90s, when I lived a different life, the wifey and I used to head down there on a regular basis. Every year for four or five years in a row, but then we had kids and it became a hassle and the weather was hot and we found a million excuses not to go. It’s right up my alley, though: lots of food booths and a beer and wine garden and entertainment. So when the forecast called for temps nearing 90 this weekend, I was bummed. Figured we might have to miss the festival again this year, but then Tara hit upon the idea of going in the evening, and that worked out perfectly. When we arrived the westering sun was already blotted out by Portland’s skyscrapers, and a breeze had kicked in off the Willamette River, keeping it comfortable. We spent a couple of hours wandering through Tom McCall Waterfront Park, sampling food and drinks from the twenty-plus vendors and food carts onsite. There were pulled pork sliders and hush puppies and Korean fusion tacos and mac ‘n cheese and a burger with pastrami & sauerkraut and elephant ears. Plus, best of all, strolling along the river, the lights of Burnside Bridge reflecting on the rippling waters of the Willamette. We were exhausted by the time we returned home, but all in all, it was a perfect day! 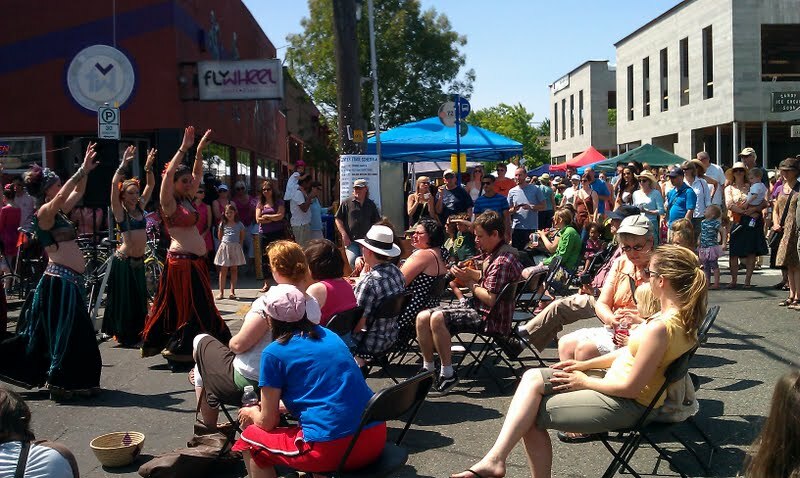 The Alberta Street Fair featured food and drinks and entertainment…including belly dancers! Reindeer sausage? Sorry, Santa – but how can we resist?! 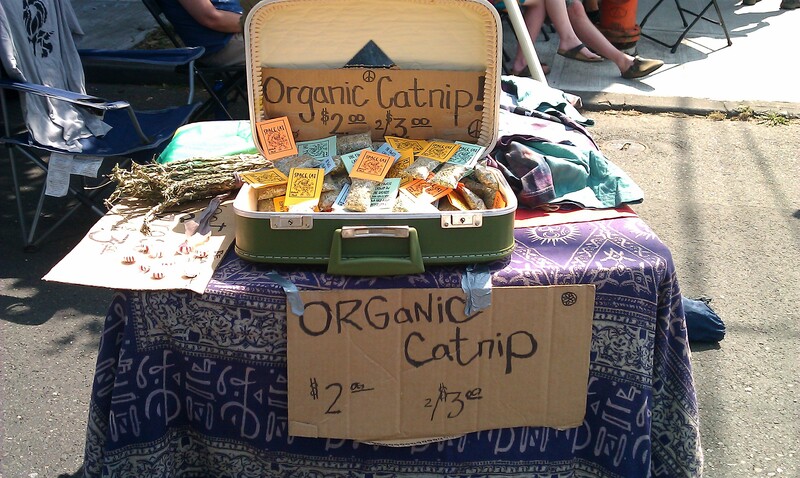 Only in Portland, where everything is organic! 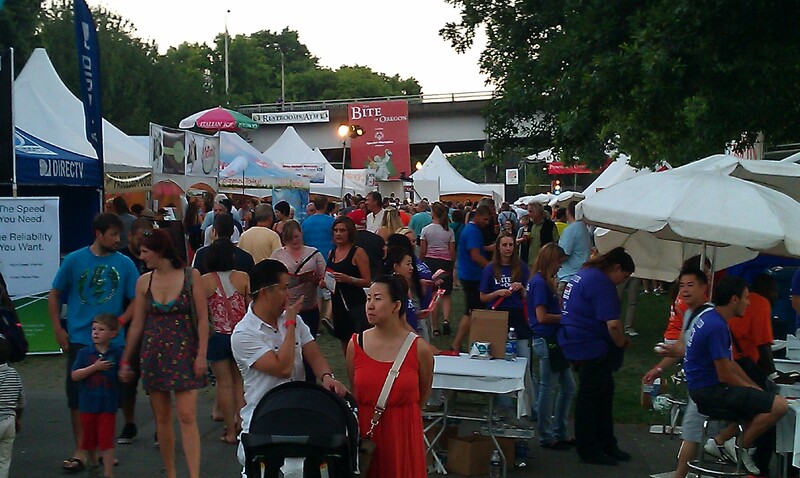 The Bite of Portland at Tom McCall Waterfront Park. 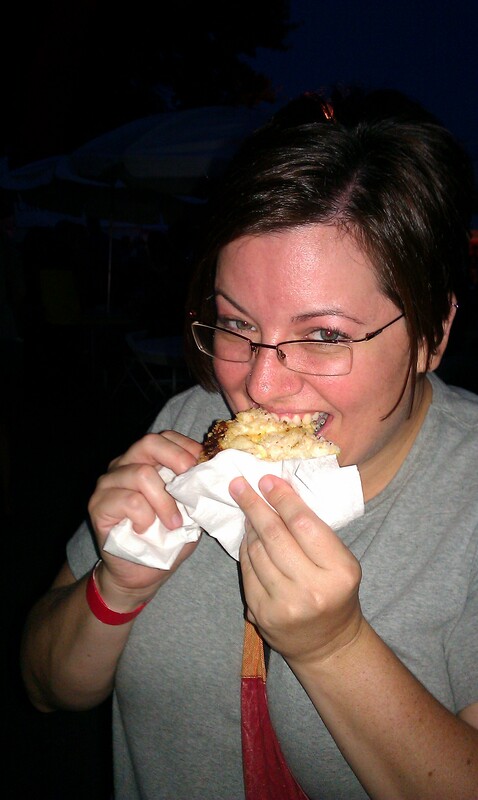 Tara, enjoying a crab melt. 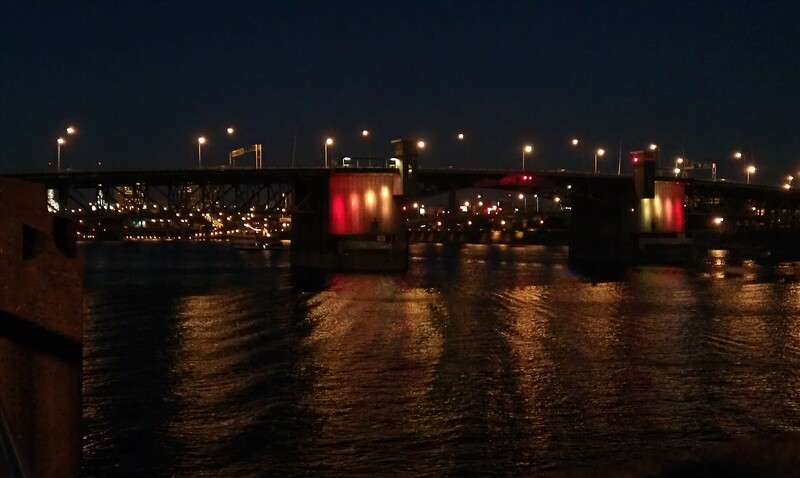 The Willamette River at night. 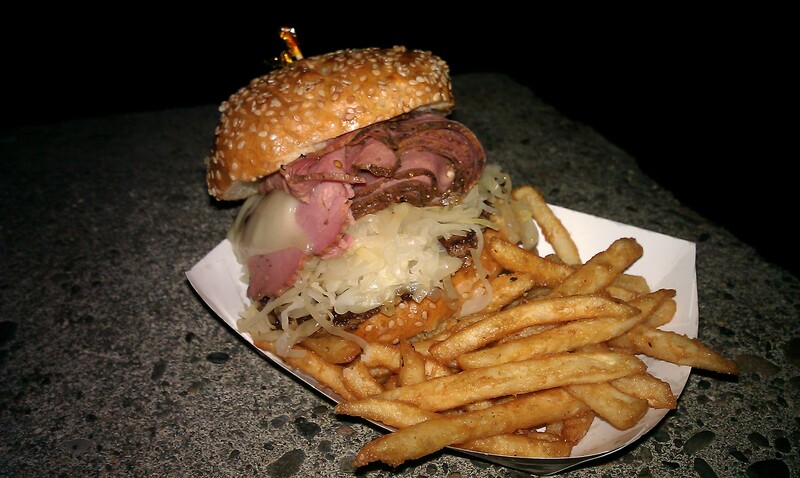 The whole purpose of The Bite of Oregon festival is to eat! I pretty much just worked all weekend…this being the 2nd day of said weekend and yes, I do have to work it. Oh…and I lived quite vicarously through you and Tara. Oh…and I did not eat Rudolph and make Santa mad. I want to be on the good list this year! Feel sorry for you and Tara being on the naughty list!! Ohhhhh….you are in so much trouble!! We’ve been on the naughty list pretty much ever since the clock struck midnight on New Year’s Day back in Ely. There’s no going back now, lol! Sorry you had to work over the weekend, but at least you’ve got Anthony tonight and tomorrow to keep you occupied! That’s it, Mark, COAL in your stocking this year for Christmas!!!! HA! Looks and sounds like you two had a faaaaaaaabulous weekend! GREAT pictures! That one of The Willamette River at night is stunning. Oh, and the one of the organic catnip made me laugh because I clicked to view it LARGE and the catnip sprigs (to the left) look like GRASS!!! The reindeer was mixed with pork and other seasonings, so you really couldn’t even tell that it was different. No matter what kind of meat it was, we loved it! Once somebody left a bag of catnip on my desk at work but didn’t leave a note or anything. I thought for sure it was weed! The stuff does have a passing resemblance, and it sure makes cats happy. Looks like you’ve been living the good life, Mark. Sorry Santa got pissed. It’s been blogger central around here this week–and I even made the evening news. Woo hoo! Best I can say is, I *watched* the evening news. I’m going to hop on over to your blog and check out the haps, for sure! Say hi to Sara for us. Oh you’ve made me so nostalgic. First night Joe and I spent in Portland was on the farmer’s market. Great music and fun vendors. That sandwich you ate looks amazing. And I’d try reindeer sausage. We ate bison sausage and bison burgers while out west. I love me a good bison burger (or steak). Got hooked on them and South Dakota back in the 80s, before buffalo meat was quite so widespread and easy to find. It’s nice to be able to get my fix every now and then!